We supply not only electric heating elements but also integrated functions. We develop and manufacture complete heating systems which include steam generators and water heaters ready for installation and provided with electric heating element, insulation, and control and regulating systems. Working entirely in-house and together with customers, we design, produce and test operational assemblies for diverse types of applications and trades, optimizing supply costs and logistics. Steam generators for professional combi ovens (standard modular range with 7,500 to 18,000 W power, single-phase compact generators, bespoke steam generators). Water heaters for dishwashers (cylindrical or parallelepiped, with a wide range of standard or customized caps). Steam generators for industrial floor washers and professional pressing equipment. Steam generators for shower cabins with sauna/steam bath function, complete with incorporated level control and safety cut-out. Water heaters for vending machines. Cylindrical (diameter 60 to 330 mm) with mobile heating elements, mainly used in the washing sector. Cylindrical (diameter 60 to 330 mm) or boxed with fixed heating element, used principally for: vending machines, floor washers, saunas/steam baths. 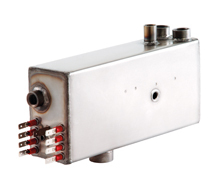 Boxed with mobile heating element, with or without inspection, suitable for applications in the catering and vending machine industries.